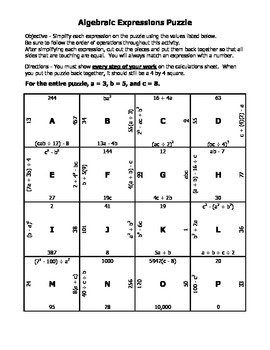 This puzzle requires students to solve a variety of algebraic expressions. It is also a good review of the order of operations. I purposely included problems such as "4a", "ac", and "8(a+c)" to introduce my students to the various ways multiplication can be shown when variables and parentheses are involved. If I simply gave my students the 32 problems in this activity on a worksheet, they would GROAN! But every time I use this puzzle I'm impressed at how motivated students are to work through the problems in order to get to the "fun" puzzle-making. Please let me know if you have any questions or suggestions. I hope it turns out to be a good resource for you!